With large parts of continental Europe currently enduring a severe heatwave, maybe some people will remember, with fond memory, the ice bucket challenge. A year ago the challenge went viral on social media and my inaugural post featured a friend of mine doing it too. People were pouring buckets/pots/canisters of ice-cold water over themselves to raise awareness and donations for a rare disease called amyotrophic lateral sclerosis (ALS), a type of motor neuron disease (MND). One person went to even greater lengths and had glacial water released over him from a helicopter. Celebrities joined the challenge too and even Homer Simpson poured a cup of cold water over himself. 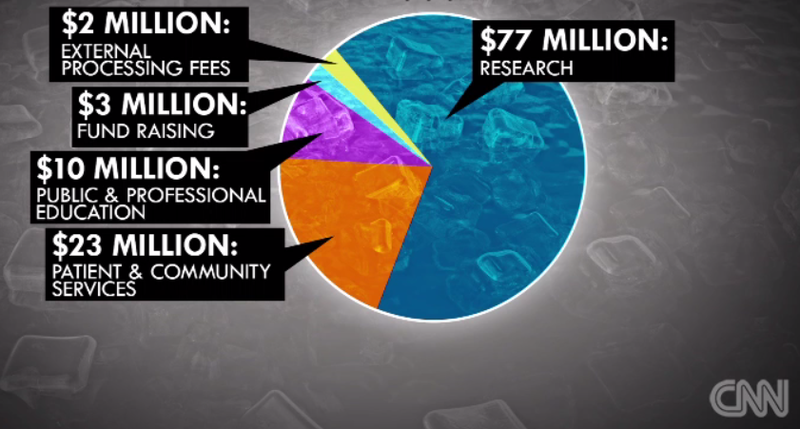 Pie chart showing where the $115 million went. – Image obtained from the video of this CNN article. Apart from research, other funds are going into patient care, such as providing improved intravenous nutrition and better mobility aids, such as walking sticks, rollators and wheel chairs. Additionally, the ALS Association is investing in education and spreading the awareness for MND even further and lastly, it is trying to motivate people to re-do the ice bucket challenge this August. And if that all goes to plan I’ll write again in a year, hopefully reporting on advances in the field and maybe with some news on the early stages of development of a new drug. A newspaper article in the Guardian. This entry was posted in Factual, Opinion and tagged ALS, anniversary, charity, icebucketchallenge, MND, research, Science by Victoria Wang. Bookmark the permalink.